There is some sense of kinship between Edgar Allan Poe (1809-1849) and the Pre-Raphaelites, particularly Dante Gabriel Rossetti. Poe famously asserted that ‘the death […] of a beautiful woman is unquestionably the most poetical topic in the world’, which brings to mind all those Pre-Raphaelite images of doomed Ladies of Shalott and, in real life, the death of Elizabeth Siddal which haunted Rossetti for the rest of his life. There can be no doubt that Rossetti was in some way influenced or affected by Poe’s writing: he actually produced a few illustrations of, and wrote a poetic response to, Poe’s most famous poem, ‘The Raven’. These are among Rossetti’s earliest works as an artist which even predate the founding of the Brotherhood in 1848. 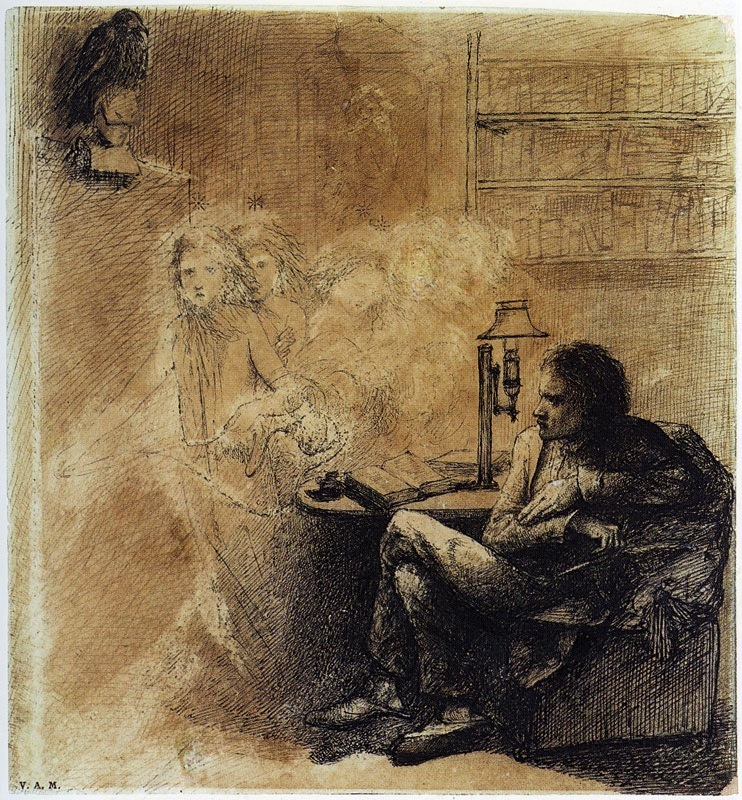 ‘The Raven’ was first published in 1845; only a year later, Rossetti drew a frantic pen-and-ink illustration of the poem’s narrator plagued by cavorting spirits and skeletal spectres, his beloved ‘lost Lenore’ looming gigantically behind him (below). J. B. Bullen recognises in this drawing the visual influence of a German draughtsman, Alfred Rethel, whom Rossetti apparently admired. There is also a possible trace of Henry Fuseli’s phantasmagoric paintings in the many strange little sprites leaping at the narrator’s feet, and in the sinuous quality of the lady Lenore. Over the next two years three more drawings followed, less tumultuous and nightmarish in tone and in an angular style which is more recognisably Rossetti’s. 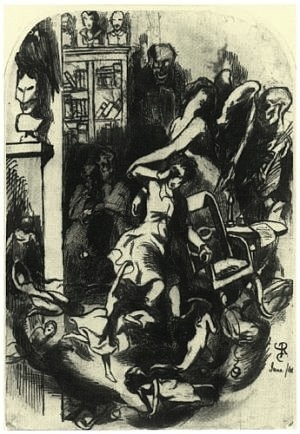 Despite the differences in style, however, the four drawings depict the same supernatural moment in the poem (the Rossetti Archive titles all of them ‘Angel Footfalls’), feature the same long-haired male figure, and share the same general composition of figures grouped around a table and a single lamp providing the only light source, with the Raven perched on the bust of Pallas Athena over the door in the top left-hand corner. Rossetti creates the illusion of a procession of angels materialising forward out of the air by retreating from detailed faces and hair in the foreground to faint, wispy outlines in the background. Interesting contrasts between the drawings emerge upon closer inspection: in the two earlier drawings the male narrator is fraught with anxiety, grasping his head in his hands in a gesture of mad, psychological fear; in the two later images he is far more composed, oddly accepting of his supernatural guests and, in the 1847 drawing, even willing to confront the apparition of Lenore face-to-face. 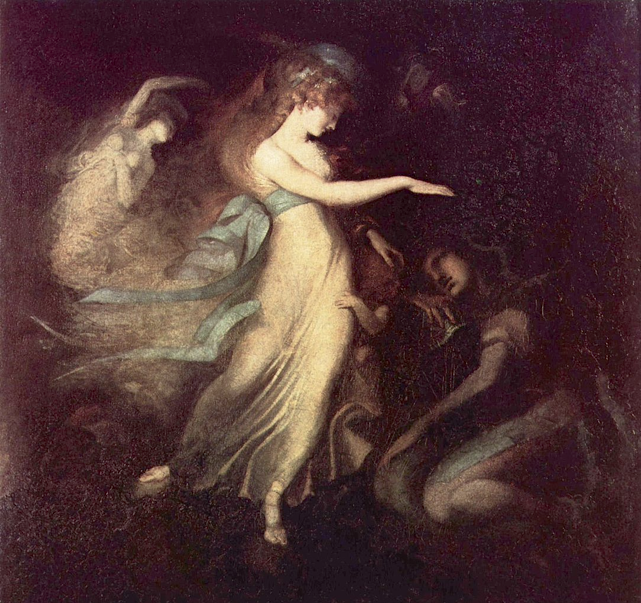 Rossetti also appears to have been experimenting with different manners of portraying supernatural figures, moving from the grotesque, frenetic, Fuseli-esque phantoms of the first drawings, to the slender, angular medieval forms of the angels in the next two drawings, to the oddly childlike, frail phantoms of the 1848 drawing. This is a decidedly Gothic, supernatural brand of Pre-Raphaelitism which is rather at odds with the PRB’s creed of ‘truth to nature’, but it was a genre to which Rossetti returned in his images of doppelgängers. These drawings by Rossetti predate the far more famous illustrations of Poe’s poem by John Tenniel and Gustave Doré. 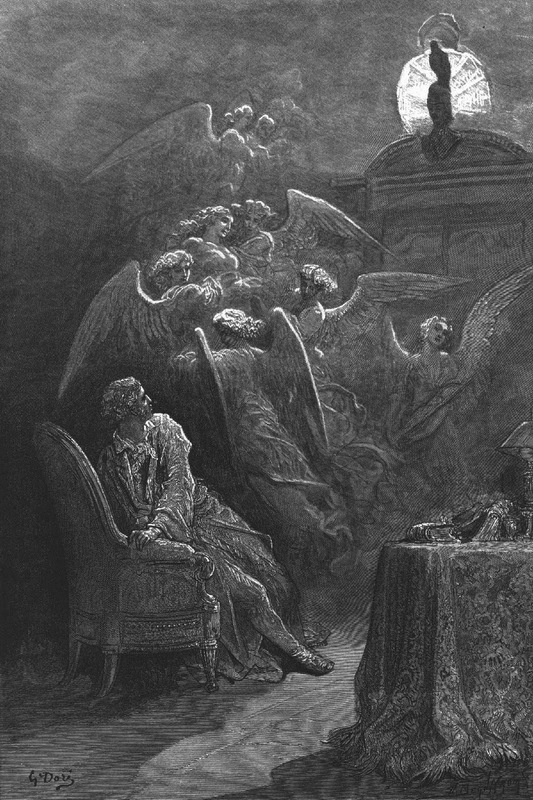 Doré’s engravings, published in 1884, are similar in some respects to Rossetti’s sketches, particularly when portraying the narrator surrounded by angels and spirits (see below). However, Doré’s images are far more refined and not as angular and archaic as Rossetti’s. 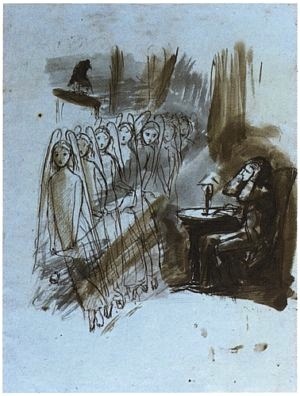 It is highly unlikely, probably impossible, that Doré ever saw Rossetti’s drawings (which were never published), but it is worth comparing how these nineteenth-century artists from different countries visually interpreted Poe’s ‘The Raven’, clearly sharing an interest in portraying angels and phantoms. That Rossetti never refined or published his sketches indicates that he created them for his own private world of fantasy, already romanticising the ideals of love, death and the heavenly woman which he also found in the poetry of Dante Alighieri. Rossetti’s poetic response to Poe, which also led to a painting, was well-known in his lifetime. ‘The Blessed Damozel’, which the Rossetti Archive calls Rossetti’s ‘single most important literary work’, was first written in 1846-47 and went through several extensive revisions from 1850-1881. 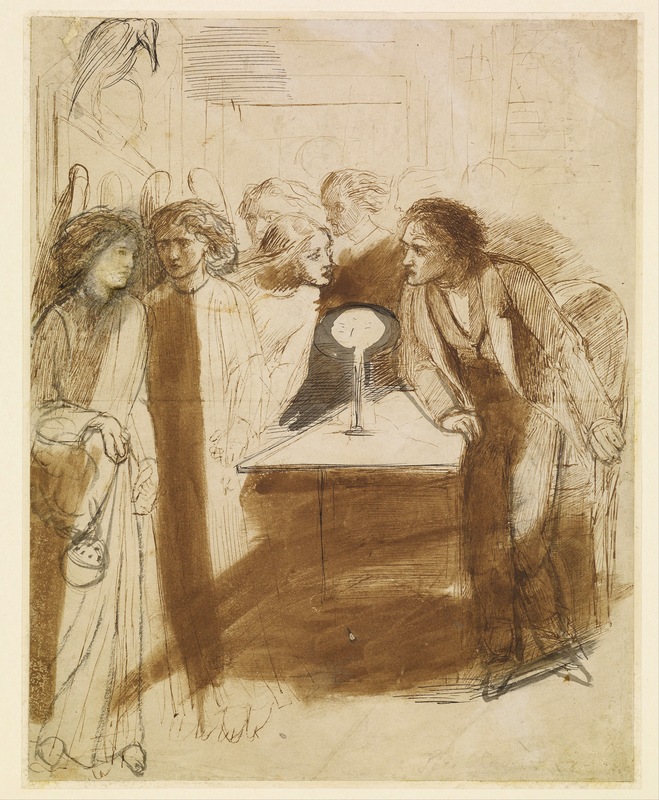 Rossetti continued to return to the poem and its subject matter throughout his artistic career, and eventually began work on a large oil painting as a visual commentary and elaboration upon it from 1871-78 (see below). The poem and painting are so central to Rossetti’s oeuvre that they deserve a separate post all to themselves, but it’s worth noting here the inspiration of ‘The Raven’ on the budding, pre-Pre-Raphaelite poet and painter. 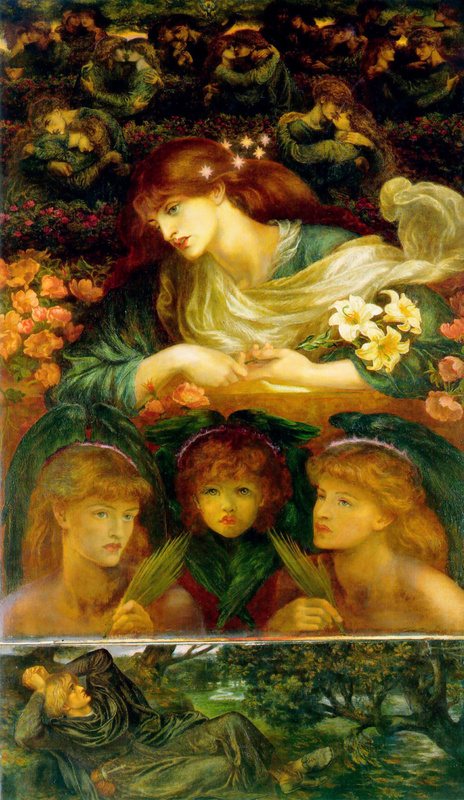 In Poe’s poem the narrator madly mourns his dead lover, the ‘rare and radiant maiden whom the angels name Lenore’; by contrast, Rossetti’s ‘The Blessed Damozel’ shifts the focus up to heaven, where the angelic maiden ‘lean[s] out / From the gold bar of Heaven’ and looks down to her lover on earth from Paradise. This time it is the woman who fantasises, in a state of patient, expectant sorrow, of the day she will ‘lie i’ the shadow of / That living mystic tree’ in heaven with her lover — she awaits his death, ‘when round his head the aureole [will] cling’ (an interesting use of the word ‘cling’, suggesting a steadfast bond, clinging like her memories), and the day they will be reunited. Much more can be said of the associations and contrasts between Poe and Rossetti, but I have at least shown that one of Rossetti’s most famous poems and paintings can be traced back to a work by an American Gothic writer. Dante Gabriel Rossetti, ‘The Blessed Damozel’, 1871-78. Rossetti painted a reduced replica from 1875-78. The four Rossetti ‘The Raven’ drawings on The Rossetti Archive. A detailed entry on the poem and painting ‘The Blessed Damozel’ on The Rossetti Archive. The text of ‘The Raven’, and the 1881 text of ‘The Blessed Damozel’. J. B. Bullen, Rossetti: Painter and Poet (London: Frances Lincoln Limited, 2011), pp. 23-25 (for more information on the ‘Raven’ illustrations). 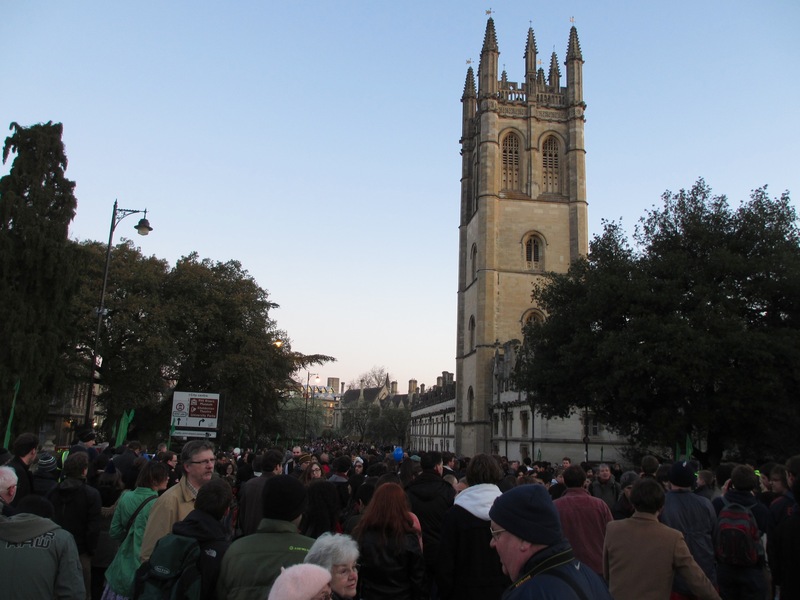 The crowd gathered on Magdalen Bridge just before sunrise on May Morning, 2013. Own photograph. Magdalen Tower at sunrise on May Morning, 2013. Own photograph. Anyone who lives in Oxford will be familiar with the ceremony of May Morning, on the 1st of May, when hundreds of students and citizens from Oxford gather on Magdalen Bridge in the minutes before sunrise. 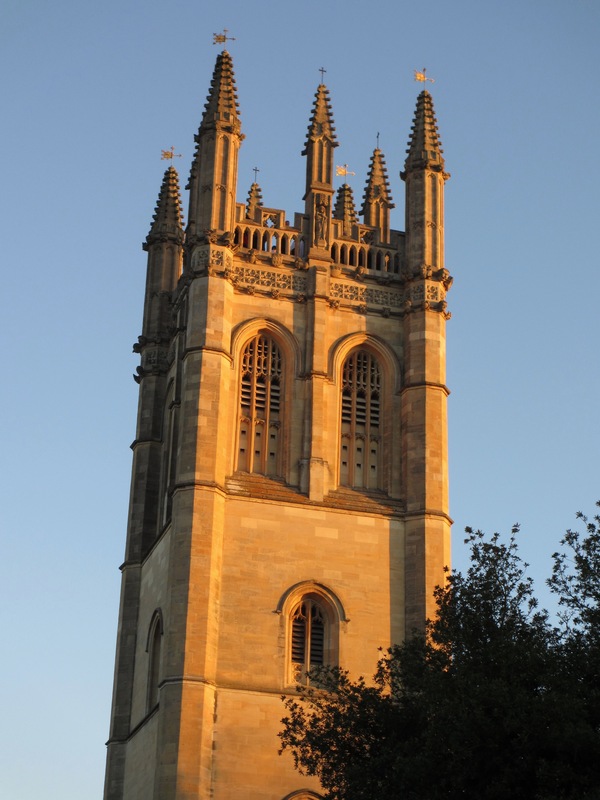 At 6 a.m., shortly after dawn, the bell of Magdalen Tower chimes the hour and the choir of Magdalen College sing the Hymnus Eucharisticus to greet the coming day. It’s a centuries-old practice in which, for a few moments suspended in time, the Christian and the pagan coexist in beautiful harmony: the act of praising the arrival of spring and the rebirth of nature on May Day is a British custom rooted in the pre-Christian past, expressed in Oxford’s May Morning through Christian prayers and hymns. I’ve attended the ceremony twice now — last year and last week — and both times I’ve been haunted by the beauty of it all; the hymn echoes from the battlements over the gathered crowd and melts with the dawn birdsong into the still air and bright sunlight. For a long time I’ve been interested in the rites and rituals of pre-Christian Europe, and there’s something particularly special about Oxford’s tradition which may be Druidic in origin. 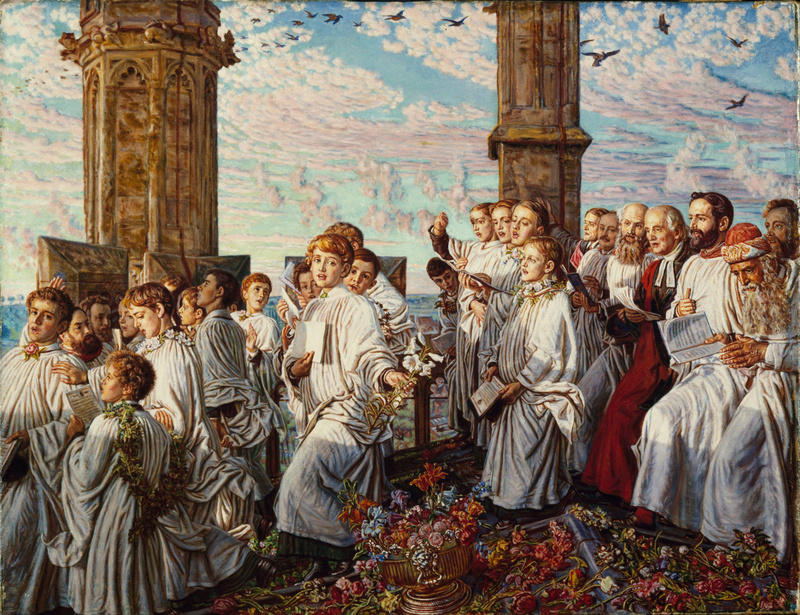 So I was intrigued to discover that William Holman Hunt had painted his own version of May Morning on Magdalen Tower. William Holman Hunt, ‘May Morning on Magdalen Tower’, 1888-91, retouched 1893. Oil on canvas, 38.8 x 48.9 cm. Birmingham Museums and Art Gallery. 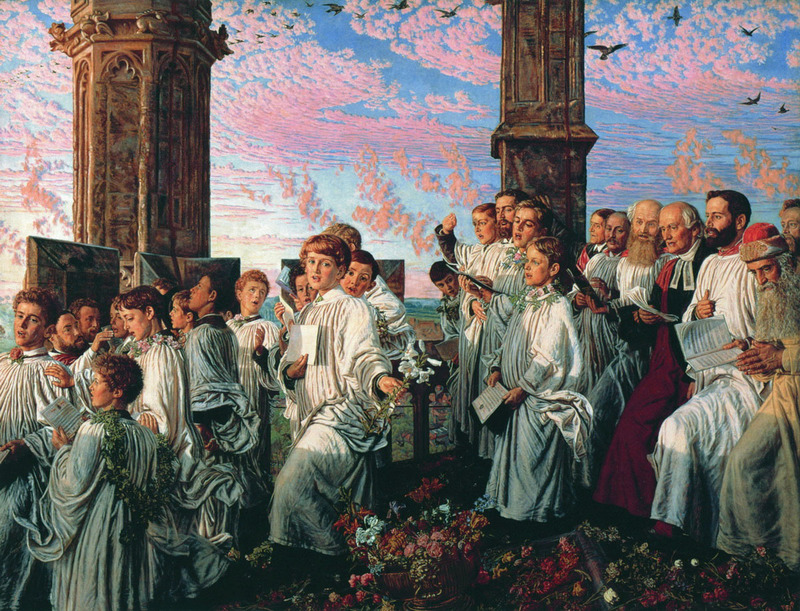 William Holman Hunt, ‘May Morning on Magdalen Tower’, 1888-90, 1890-91, retouched 1865. Oil on canvas, 154.5 x 200 cm. Lady Lever Art Gallery, Liverpool. Detail of the choir boys from the smaller Birmingham version. Hunt’s son Hilary is on the far right, garlanded with apple blossoms and holding the score of the Hymnus Eucharisticus. The lily held by the red-haired choirboy, at the centre of the composition, is an emblem of Magdalen College, a college dedicated to the Saints Mary Virgin and Mary Magdalene. 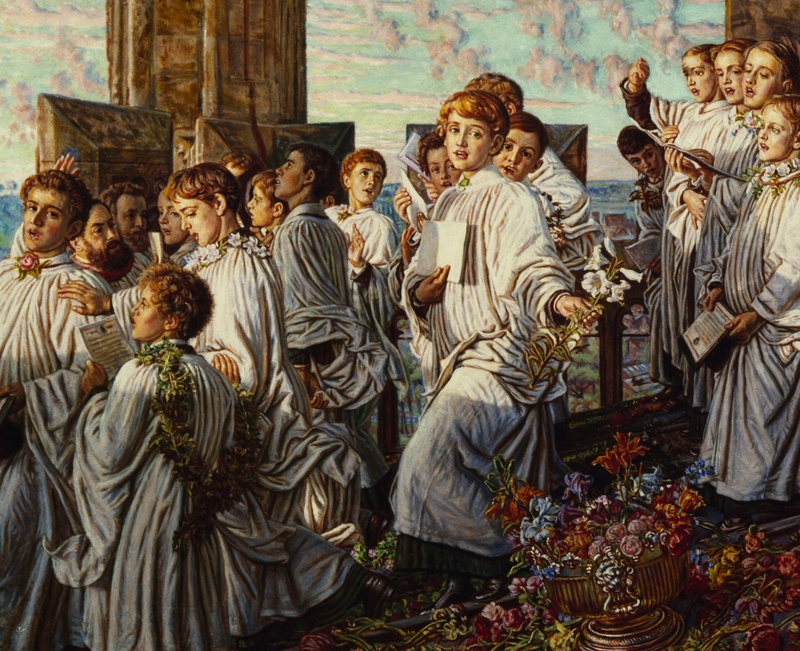 This painting is one of my favourite Pre-Raphaelite images — not only because of its connection with Oxford, reawakening memories of previous May Days in the city, but also for its gorgeous colours and abundant floral details. I particularly admire Hunt’s depiction of natural light on a spring morning, with large portions of the canvas filled with pinkish wisps of clouds and the brightening sky. It makes the painting feel airy and open, with glimpses through the battlements of the distant blue horizon to the south which the golden rays of the rising sun are yet to illuminate. Further details of the River Cherwell and, I presume, the greenhouse of the Botanic Gardens, can also be seen through the gaps in the Gothic masonry. The flock of birds flitting joyously overhead echoes the line of young choristers underneath; both the birds and the people are singing their dawn choruses in the fresh light of spring. If online reproductions are anything to go by, the two versions of the painting are different in colouring: the Birmingham version is brighter, paler and more golden; the Liverpool version has deeper contrast and shadows and the light is rosier and more vivid, with a stronger sense of the sun having only just risen. Bronkhurst also notes a difference between the two versions in the bearded figure in the left foreground of Dr Varley Roberts, Organist of Magdalen College. In the Birmingham picture his right hand is raised over his head (see the detail above), but in the main version Hunt corrects this by positioning the hand outstretched at shoulder level, making it clearer that he is conducting the Hymnus Eucharisticus. Apparently, too, the larger version is more accurate as there were only 16 choirboys at Magdalen, and you can count 17 in the preparatory version. Nevertheless, in both paintings Hunt beautifully recreates the mood of reverence and the veneration of nature on May Day. Finally, a note on frames. 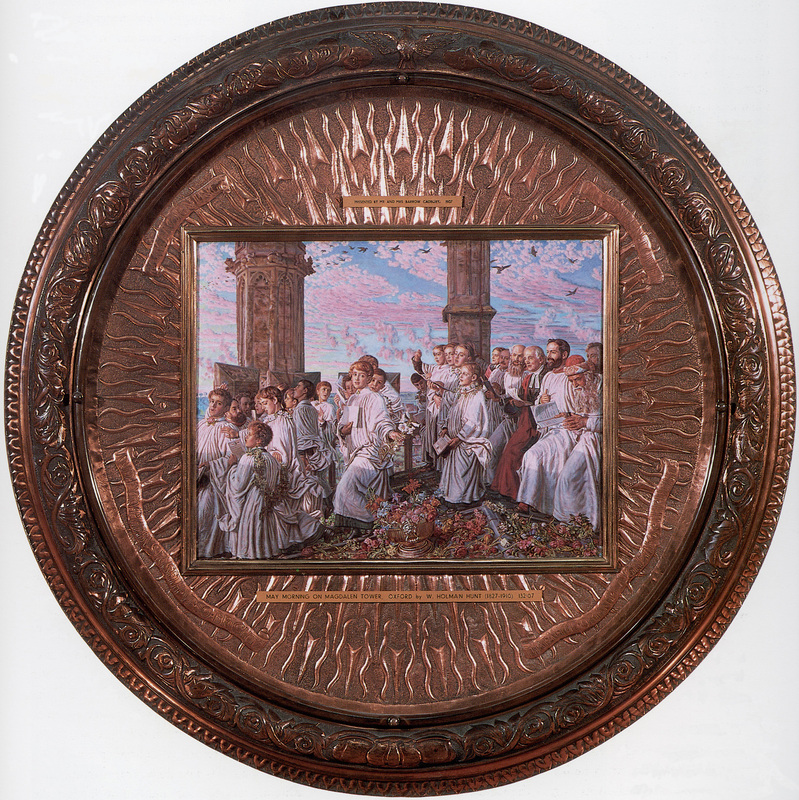 The Birmingham version is set in a large circular copper frame which Hunt designed. It was executed by John Williams, a member of the Guild of Handicraft, which was founded by the Arts and Crafts designer Charles Robert Ashbee in 1888. Sunbursts radiate from the oblong panel, and on ribbons a quotation from Chaucer’s The Knight’s Tale is inscribed in Middle English: ‘And Fyry Phoebus ryseth up so brighte / That all the orient laugheth at the sight [sic]’. The outer edge of the frame is decorated with a scrolling floral pattern, and a lark outstretches its wings at the top. A considerably lavish treatment, given that this version is a study for a larger work! Pictures of the equally beautiful frame of the Liverpool version can be viewed on the Frame Blog. Judith Bronkhurst, William Holman Hunt: A Catalogue Raisonné, Vol. 1: Paintings (Yale: Yale University Press, 2006), pp. 265-269. Many videos of the May Morning ceremony and the Hymnus Eucharisticus can be found on Youtube. Here is a particularly good one from 2013, taken from the quadrangle of Magdalen College. The Latin words of the hymn, with engravings, can be read here. The Birmingham version on the Google Art Project.